Above are several images of the same rock sample: a highly deformed quartzose siltstone collected from the Womble Formation, Ouachita Mountains, Arkansas. The uppermost image shows a cut and polished surface. 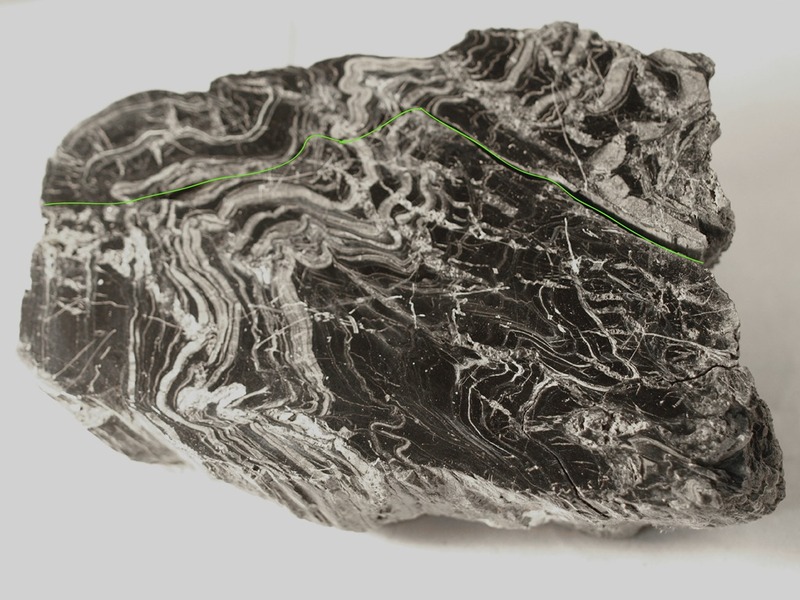 The green line that’s been added to the picture defines a fracture that split the sample after it was cut. Ordinarily, that would be a bitter turn of events but, in this case, it was a fortunate accident. 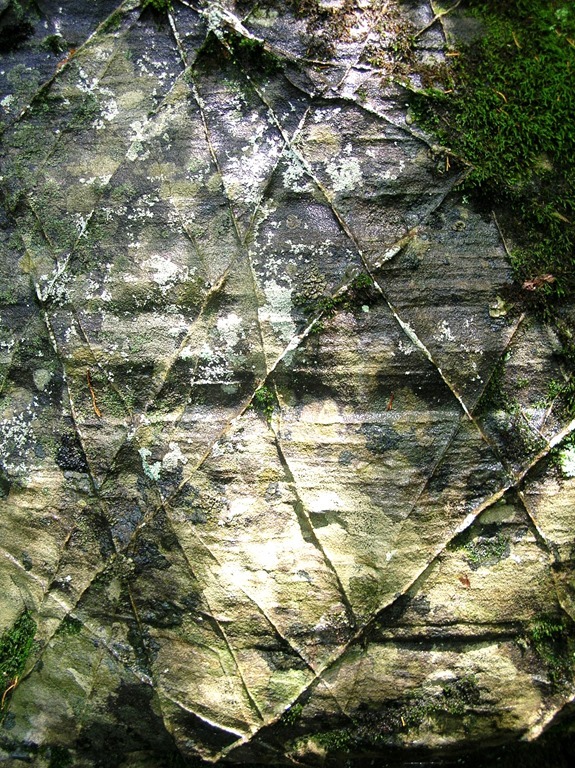 The fracture provides a rare, multi-dimensional view inside a tightly folded rock (lower photo). Luckily, the fracture propagated across the bedding rather than breaking along a bed, which makes the beds of the fold appear to fan out like a deck of cards showing a lot of the detail of the structure. 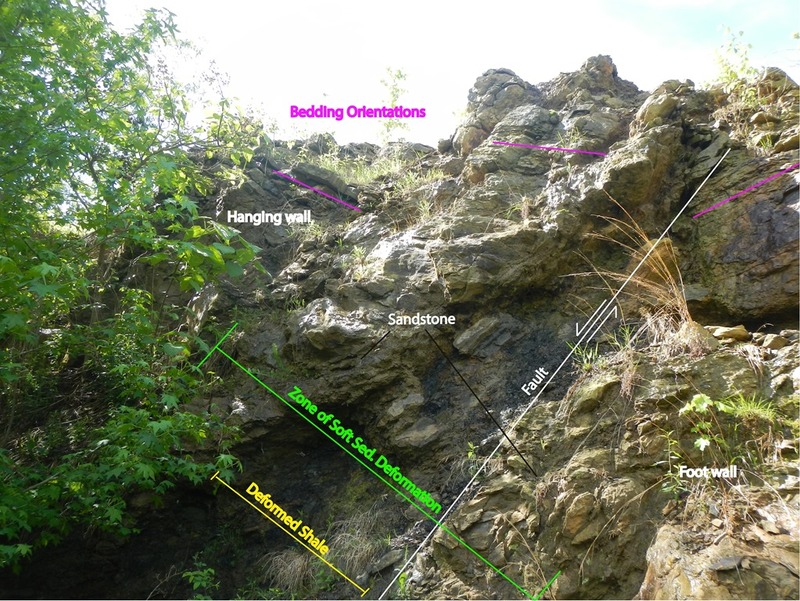 This entry was posted in #geoblog, GeoPic of the Week and tagged Arkansas, Central Arkansas, deformation, Ouachita Mountains, Siltstone, structure, tight folds, Womble Formation on August 7, 2017 by argeology. Pictured above is one of many faults, closely spaced together, in an outcrop of the Atoka Formation, near Lake Fort Smith, Arkansas. The fault pictured extends from the upper right to the lower left and is highlighted. This type of faulting is called syn-depositional faulting, meaning it occurred at about the same time the rock was being deposited. It results in disturbed-looking outcrops like this one. Around 300 million years ago, plate tectonic forces were deforming the Ouachita Mountains in south central Arkansas. Those forces also caused faulting in the southern Ozark Plateaus, as the sediment that composes this rock outcrop was being deposited. The freshly deposited sediment wasn’t fully consolidated when the faulting took place and the rock surrounding the fault got contorted by the stress. Some of the deformed features of the outcrop are labeled above. The Zone of Soft-Sediment Deformation is the area surrounding the fault where the rock has been deformed by shearing: there is no recognizable bedding in that zone. The soft clay-rich Deformed Shale was squeezed plastically between the fault blocks in that soft sediment deformation zone. The bedding orientations surrounding the deformation zone (indicated by magenta lines) vary greatly, because the soft bedrock was broken and heaved around by the fault. This entry was posted in #geoblog, GeoPic of the Week and tagged Arkansas, Atoka Formation, Geology, Lake Fort Smith State Park, Ouachita Mountains, Soft Sediment Deformation, structure, Syn-depositional Faulting on May 15, 2017 by argeology. The picture above shows a normal fault exposed in an old railroad grade just north of Greers Ferry lake in the Ozark Mountains of central Arkansas. Two different lithologies are juxtaposed against one another: siltstone on the left and sandstone on the right. Exposures such as this one are relatively rare in the Ozarks where most of the bedrock is covered by loose sediment and vegetation. This fault is extensive and roughly parallels the northern portion of Greers Ferry lake. The fault gives the northern portion of the lake its linear shape (see below). 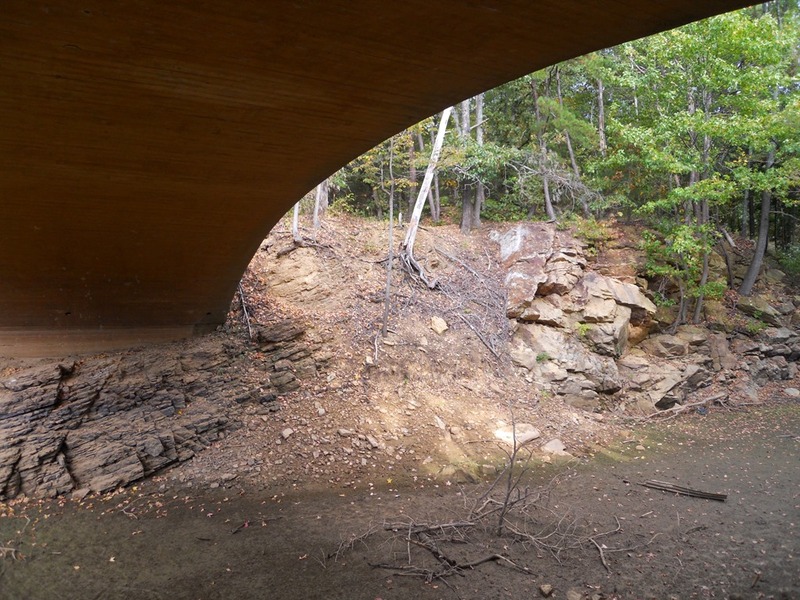 This entry was posted in #geoblog, GeoPic of the Week and tagged #geoblog, Arkansas, fault, Geology, Greers Ferry Lake, Ozark Mountains, Pennsylvanian, Sedimentary Rocks, structure on October 3, 2014 by argeology. Tight recumbent folds in a fresh exposure of Bigfork Chert, Ouachita Mountains Arkansas. Thin chert beds divided by siliceous shale beds are the basic lithology of this Ordovician age (540 to 490 Ma) formation. Complicated structures like those pictured below are characteristic of the rocks that form the Ouachita Mountains. 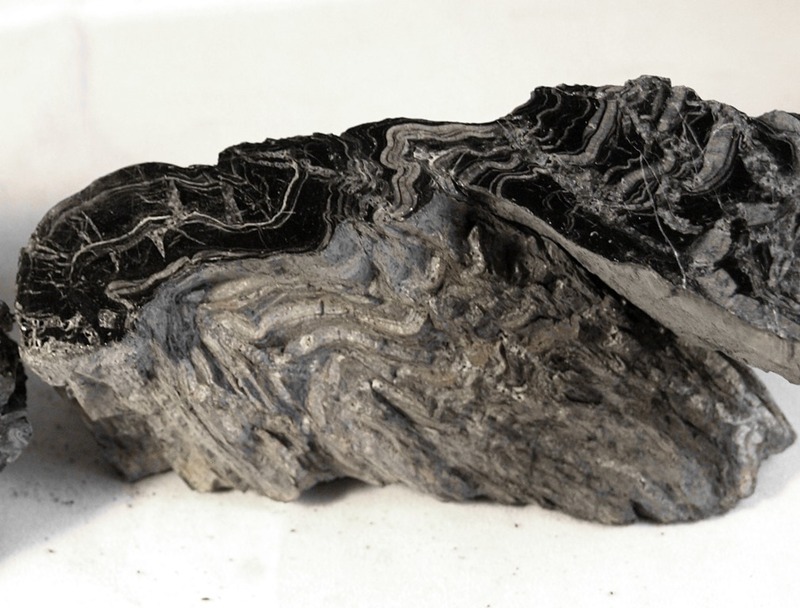 The complex folds and faults resulted from plate tectonic forces that compressed the rock and caused many of the structures to rotate and overturn. 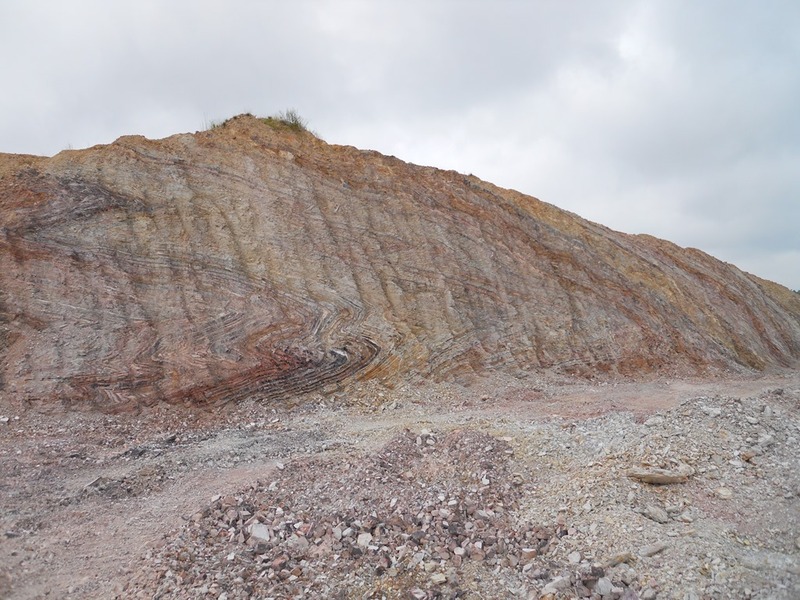 This entry was posted in #geoblog, GeoPic of the Week and tagged Arkansas, deformation, Geology, Ordovician, Ouachita Mountains, quarry, recumbent fold, structure on September 4, 2014 by argeology.